Talking football: Wiganers don’t half love a moan! So Will Grigg’s back on fire – and not before time with this freezing cold weather looking here to stay! 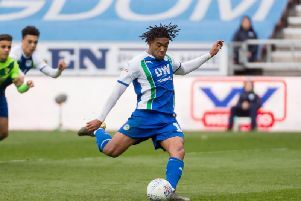 Two quickfire goals from the Northern Ireland hotshot got Latics out of the brown stuff in midweek against non-league Fylde. “I couldn’t see us scoring, I couldn’t see us creating a chance,” admitted boss Paul Cook - and he wasn’t wrong. But thankfully Grigg was in the right place at the right time to take his tally for the season to seven – and four in the last four games. Given he always scores the vast majority of his goals in the second half of the campaign, you can understand why he’s always been confident of reaching his minimum 20-goal a season target. It’s a situation that’s mirrored with Latics themselves, who clearly have a gear or two still to find despite things going so swimmingly at the moment. Four points clear at the top of League One ahead of the festive period, Latics are an amazing ELEVEN points better off than at this stage two years ago, when of course they went on to win the title in style. It’s frightening to think what this team is capable of if and when it eventually hits its straps. The likes of Grigg, Nick Powell, Michael Jacobs, Max Power and Ivan Toney have only scratched the surface so far in terms of potential. When it does click – as it surely will very soon – the rest of the season should be hugely enjoyable indeed. It was at this point under Gary Caldwell two years ago that Latics took advantage of the festive programme – and their superior squad strength – to really kick into the New Year, embarking on an unbeaten run that lasted four months. Given Cook has a similarly strong pool of players at his disposal – with even long-term absentees Shaun MacDonald and Craig Morgan set to return very soon – plus the possibility of a couple of arrivals during the transfer window, it’s looking good at the moment. Despite this, there were once again a few boos during the midweek game against Fylde – which I have to say I thought was extremely harsh. Boss Cook again made reference to it in his post-match press duties – again totally unprompted from journalists – which shows it’s an issue for him, and something he’d like to see nipped in the bud before it becomes something bigger. Wiganers, as we know (and love), don’t half love a moan! The future of two loan stars should be high on the agenda as the transfer window prepares to open for January business. Jack Byrne, currently out on loan at Oldham, scored another blinding goal at the weekend, and is receiving rave reviews for his performances in a struggling side. On the other hand, Lee Evans, on loan from Wolves, is playing equally well for Latics, providing both assists in the 2-0 victory over Fleetwood. It looks unlikely Paul Cook would be able to find room for both in the Latics engine room, particularly with the likes of Sam Morsy and Max Power playing so well. And I wonder with Wolves looking such good value for promotion from the Championship, whether Cook may look to make a permanent move for Evans. Which would in turn surely signal the end of Byrne’s Latics career, before it’s even got going. It’s another ground to tick off for me this weekend at Wimbledon, and it’s great to see them doing well after the whole MK Dons saga. But surely it’s time for them to let that particular gripe go. There were reports at the weekend that Wimbledon failed to inform the MK Dons youth team travelling down for a fixture that the game had been called off due to the bad weather. We all know what went on between the two clubs, and most of it wasn’t right. But this persistent petulant behaviour – including failing to make reference to ‘MK Dons’ on the scoreboard during a recent fixture – does no-one any favours.